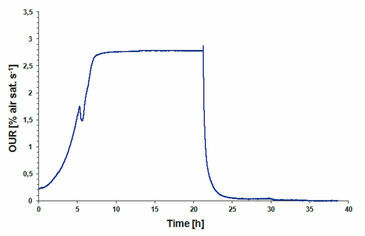 E. coli K12 shows distinct diauxic growth in medium containing glucose and lactose, which could be monitored with the SFR vario. Measurements were stopped several times for offline sampling - to determine substrate concentration - showing in gaps in the graphs. In the first growth phase glucose is consumed (1). The system reveals less precision in the lower biomass range, but this improves with increasing cell density. While the acetic acid produced by the bacteria lowers the pH of the medium the strong decrease of oxygen concentration down to 10 % a. s. indicates high metabolic activity. When the glucose concentration drops below 0.1 g L-1 after about 6 h (determined offline, data not shown here) growth stops and the oxygen level rises rapidly. 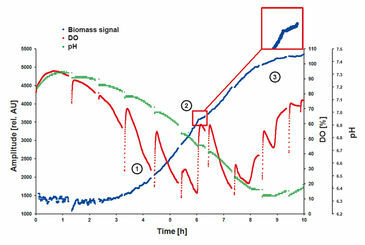 This also shows in a small plateau (zoomed insert) in the online measured biomass curve (2). 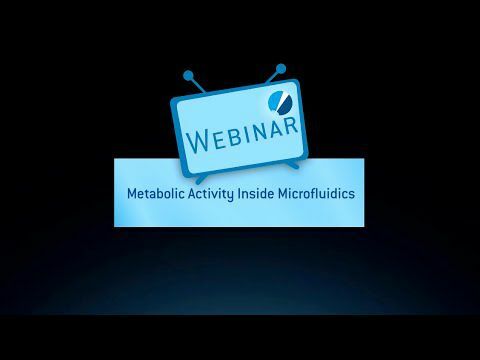 During this phase the bacteria adjust their metabolism to lactose. Recording this exact match in stop of oxygen consumption and growth could only be realized with the new online monitoring system. In the third phase E. coli grow on lactose until it is consumed and the culture turns into stationary phase (3). 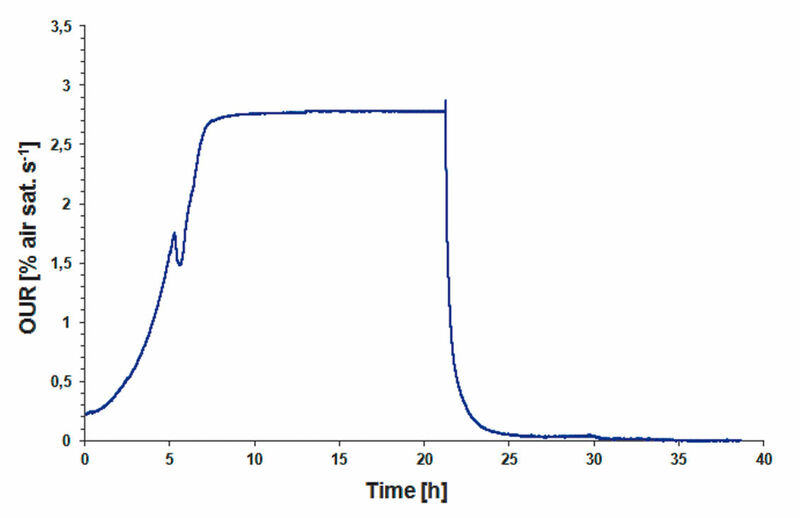 K. marxianus shows two growth phases when cultured in shake flasks with glucose as substrate. In the first phase glucose is metabolized under aerob conditions (1), and the oxygen content decreases continuously down below 5 % a. s. . Due to metabolic products the pH decreases from a value of 7 to 6.1. After 9 hours cultivation period the glucose is completely consumed (determined offline, data not shown here), and pH increases again. 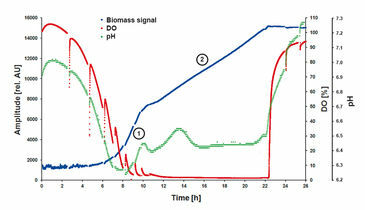 During the second - oxygen limited - phase K. marxianus shows significantly slower growth, which can be clearly observed in the scattered light (= biomass) measurements (2), while metabolizing the glucose products generated in the first phase under high oxygen demand. 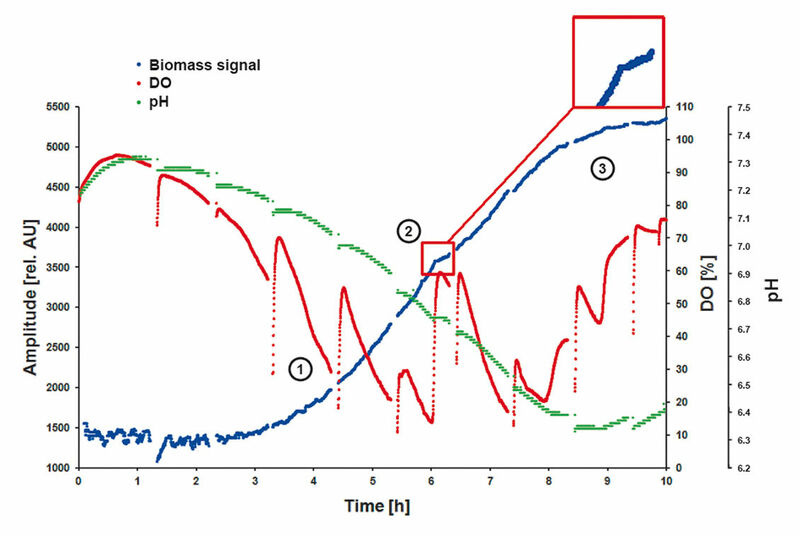 The simultaneous monitoring of oxygen, pH and biomass with the SFR vario offers whole new possibilities for culture monitoring and evaluation of metabolic processes. 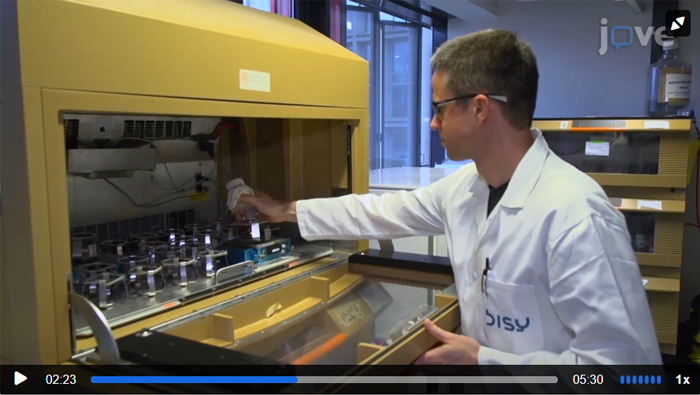 Anton Glieder and his colleagues from bisy e. U. and the Institute of Molecular Biology of the Technical University of Graz published a video article (J. Vis. Exp. (143), e58589 (2019)) describing a simple shake flask cultivation system for methanol free expression by P. pastoris. Online monitoring with the SFR vario and constant slow glycerol feed were used to simulate bioreactor conditions. This approach contributed to come closer to real bioreactor conditions compared to mostly applied small scale batch cultivations. Watch the VIDEO on https://www.jove.com/video/58589/! Can the same meter be used for pH, oxygen or CO2 sensors?Can the SFR vario be used for biomass monitoring in mammalian or insect cell culture?Does the SFR / SFR vario fit into my incubator / shaker?How can I do a biomass calibration with the SFR vario? Can I calibrate only for OD measurement?How can I perform online CO2 measurements with the SFR vario? Are there flasks with already integrated CO2 sensor spots?How do I import data into excel from a text file containing measurement data?How is the SFR / SFR vario system attached to the shaker?How long can I measure with the SFR vario battery?I am using SFR / SFR vario. What is the difference between SFS v3 and SFS v4?Is one biomass calibration function valid for different SFR vario devices running with the same biological system under the same conditions?Is the SFR vario measuring OD (optical density)?What is the measurement angle and how is it determined?What is the time of delivery?Which flasks can be used with the SFR vario?Which microorganisms have already been tested for biomass measurement with the SFR vario? 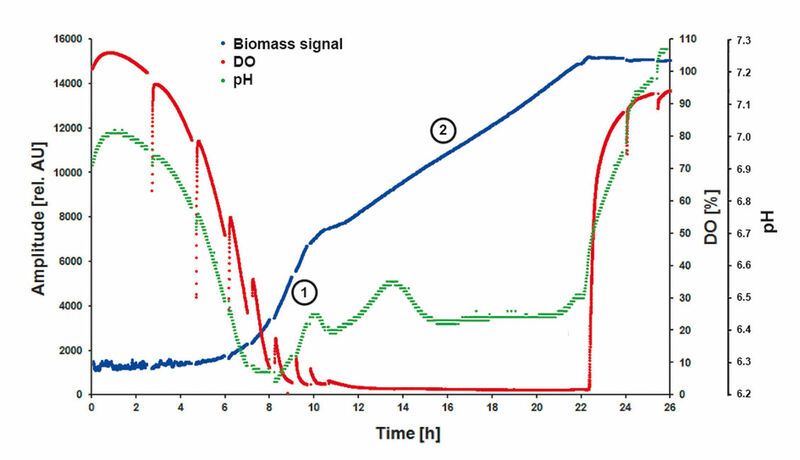 And in which range can the biomass for different bacteria and yeasts be measured?